Have you got a pair of cuff links but there is no cuff links shirts to go along? Well this is a fashion trend that you are sure to love. Let me share with you a little trick you can do it if you don't have a cuff link shirt. Well, actually a tip from a friend which helps me saves some dollars on cuff links shirt. 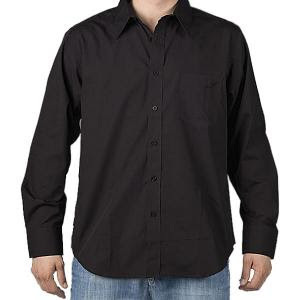 I am sure everyone knows that the price of a normal cuff link shirt would be around 80 to 100 dollars. You might be hesitant to purchase your first pair of cuff links due to the shirt price is much more expensive then the cuff links. Well then the more you should read this tips that I am about to share with you. Do you have many long sleeves shirts but none of them are cuff links designed ones? How about this -> I can turn your normal long sleeves shirts into a fashion trending shirt in a few steps plus you get to wear your long sleeves shirts and cuff links enable shirt as and when you like it. Step 2: Align the sleeve button hole and mark at the place where the button use to be. Step 3: Repeat for both side. Step 4: Cut a hole size of the button hole and sew it nicely or you can get a tailor to do it for you. Step 5: Sew one button next to the remake button hole on both sides. Now, you have a cuff shirt and a conventional shirt which you can interchange! To cut my story short in case you don't understand, I have included a picture to illustrate on my blog. Hope this can helps you save some money on cuff shirts and get you interested in cuff links! Remember we dress to impress others after all.